This has been one the most emotional weeks in our household in a very long time. I’ll get right down to it. Scott has been promoted from the Head Football Coach/Campus Athletic Coordinator at Steele High School to the Schertz Cibolo Universal City School District’s Athletic Director, responsible for athletics, health & physical education. While it’s a promotion, and an incredible opportunity for him, because I’ve never even known him NOT as a coach in our entire 13 year relationship, I am still trying to process the fact that he will no longer be coaching football at this time! And I have to admit that I’m sad about this and will very much miss seeing him on the sidelines. For those of you who have known me for a long time, you will understand the irony in this as it’s taken me years to get to where I am today as a coach’s wife. However, that said, I will of course support him in this new and exciting role, keeping in mind the Bible verse, “And we know that for those who love God all things work together for good” (Romans 8:28). 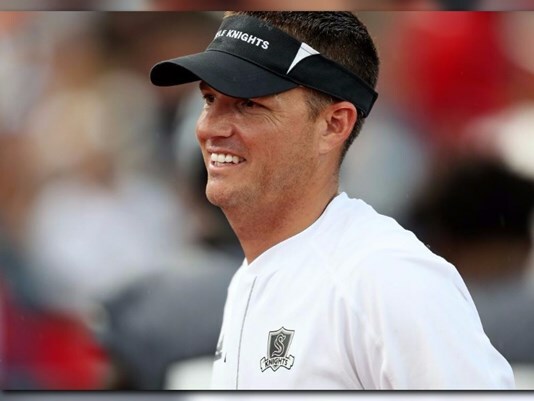 I know that the decision to leave not only coaching football, but the wonderful staff and players at Steele HS was a tremendously difficult one for Scott and will be an adjustment for sure (read his comments on Twitter here). I keep hearing from everyone about what a tremendous asset he will be to the district in this position, able to impact even more athletic programs/coaches/student athletes, etc, and it has been great these last few days to feel the overwhelming support as we move into this new phase of life. I’d like to take a moment to give a huge shout out to all of Knight Nation for the incredible support during Scott’s tenure at Steele HS. I’ve written about this many times in the past on my blog, but it’s been such an honor to be a part of the Steele community family. From players to coaches, parents, teachers, administrators, trainers, cheerleaders, dance teams, band, support groups and fans, this has truly been a very special place to be. To the Steele Knight coaches wives: you all are an amazing group of women and I have more than enjoyed our fellowship over the years. Thank you for everything and especially for all of the help with the little Lehnhoffs as our clan grew each season (haha). You graciously let them climb all over you, eat your candy treats, and double dip in your nacho cheese, and for this, I thank you! I could not have survived without you, and I’m so glad that we aren’t going anywhere and that we’ll still get to see each other! And to Pam, Scott’s secretary, you are the best. Seriously. We both know that without you, Scott would have been lost at least half the time! I appreciate everything you did for him and for us. Thank you. And yes, for those of you wondering, our children are going to be very confused by all of this, LOL! But, as Scott always says, kids are resilient and they’ll handle the change just fine. And besides, this is only a chapter, not the end of the book! If you’d like to read more, here is one of the more in-depth articles that I’ve seen so far.